FCC Vote Means Internet Providers Need Permission To Share Your Data : The Two-Way Internet service providers will have to ask consumers before collecting and selling their data. However, the new rules do not apply to Google, Facebook and other tech giants. 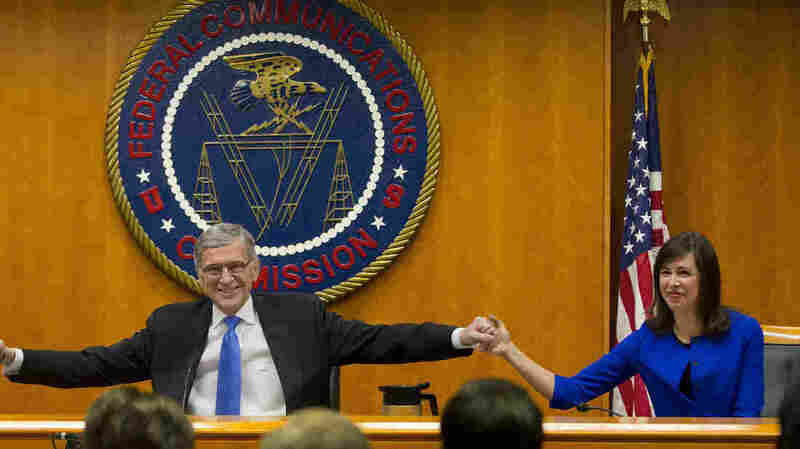 Federal Communication Commission Chairman Tom Wheeler joins hands with Commissioner Jessica Rosenworcel ahead of a February 2015 hearing in Washington, D.C.
"It's the consumers' information. How it is used should be the consumers' choice." So said FCC Chairman Tom Wheeler as the commission adopted rules requiring Internet service providers such as Comcast and Verizon to get customers' permission before selling the data they collect to marketers. The vote was 3-2 along party lines. ISPs are the gateway to the Internet and collect information about the movies we watch, the websites we visit and, in the case of smartphones, the actual physical locations of where we are. It's a valuable trove of data, which the ISPs typically collect and package to data brokers and marketers without consumers' knowledge or permission. As Commissioner Jessica Rosenworcel, who voted for the new rules, put it, "Our digital footprints are no longer in sand, they are in wet cement." Under the new FCC rules, ISPs will have to inform consumers about what information is collected and how it is used and shared, and identify the types of entities with which the ISP shares the data. Most important, ISPs will be required to obtain consumers' permission — what the commission calls "opt-in consent" — to share the information. Critics point out that the data collected by ISPs represent a small slice of the information that is gathered online. And tech giants such as Google, Facebook and Twitter aren't covered by the new rules. Commissioner Ajit Pai, who voted no, cautioned that the "cold reality" is that nothing in the new rules will stop those companies from "harvesting and monetizing your data," including the websites visited, YouTube videos watched or search terms entered on any device. Industry reaction was largely negative. The Direct Marketing Association said in a statement that the FCC's move "is bad for consumers and bad for the U.S. economy." Privacy groups, on the other hand, were pleased. The Center for Democracy and Technology called the rule "a significant step forward in protecting internet users, who have no choice but to expose massive amounts of information to broadband providers." ISPs will have a year to comply with the new regulations.